gf fig newtons, originally uploaded by shaunaforce. Lately, Ive been thinking about all that processed food I ate as a kid. TV dinners, bad candy bars, Oscar Mayer meat packs, Jolly Green Giant green beans from a can: everything came labeled and stuffed full of preservatives. It was the 1970s, the 1980s. The television told us what to eat, and we paid attention. We all ate like that– with the exception of a few strange friends of mine whose mothers actually made their food from scratch. (And now, I envy them, but they mostly say they felt bad they couldnt have the food on the commercials between Saturday morning cartoons.) Its amazing to me now, but that was the food supply of my childhood. Iceberg lettuce, ranch dressing, Wesson oil, and anything vacuum-packed. And of course, almost all the packaged foods I ate as a kid were filled with gluten. I dont miss it. Ive lost my taste for enriched white flour, everything stuffed with sugar, and anything wrapped in plastic. Before my celiac diagnosis, I never knew what good felt like. Now that I know that my enervation and headaches are directly related to the evil gluten, Ive lost my taste for it. Except, a couple of days ago, I started missing Fig Newtons. I dont know why, exactly. Theyre really not that good. All of them the same size, the cookie part a bit dry, and the fig a uniform shape, ending at the edge. But when I was a kid, I grabbed stacks of them from the rattly plastic tray and ate them while reading my favorite books. Its funny, because every other food blogger is talking about being done with baked goods for awhile. I really didnt eat many over the holidays. I just didnt want them. But now, I do. Maybe its something about the dark winter time — the holidays over, the rain incessant — that makes me want to curl up with a book and some cookies. So what could I do? Yesterday afternoon, I started pulling cookbooks off the shelves, consulting websites, hoping someone had a recipe for gluten-free fig newtons. I couldnt find one I liked, even the ones for regular fig newtons, which I thought I would adapt. So, I made one up. Before I had to stop eating gluten, I was a baker. I could make a pie crust with my eyes closed. Warm cookies appeared from my oven in half an hour. People always asked me for my recipe, even when I was using the one off the back of the Nestle Tollhouse chocolate chip package. For whatever reasons, the science and art of baking appealed to both sides of my mind, and I loved having my hands in dough, kneading something out of nothing. For the first few months after going gluten-free, I thought I would never bake again. I learned to adapt. There are so many fantastic foods without gluten that I didnt need to dwell on what I couldnt have. Who needed to be a baker when I could be a chef in my own kitchen? But if I know anything about life, its this: everything changes. After months of relying on gluten-free flour mixes, I finally took the plunge. I bought all the alternative flours in little bags, most of them from the wonderful Bobs Red Mill. My middle refrigerator shelf is filled with clear bags of millet flour, quinoa flour, teff, and xanthan gum. And now, I know them all so well that I just reach for them and start making up a recipe without needing to consult books. I just start baking. This evening, after a delicious dinner of sauteed salmon and roasted quinoa I made with homemade chicken stock, I set my KitchenAid whirring. Put on my favorite new cd — a Christmas present from my brother, a mix cd called Food Fight, with songs from Lou Reed, Tom Waits, Monty Python, the B52s, and the Hoosier Hot Shots, all songs about food — and danced in the kitchen, gluten-free flour flying. I could feel that old feeling under my hands: the patting reassurance of baking without trepidation. Warm butter, creamed sugar, the sharp tug of nutmeg in my nose. The lovely, soft pull of dough. And that intoxicating aroma as the sweet, spicy cookies are baking in the oven. These cookies taste exotic and familiar at the same time. The thick fig spread tastes like the gunk we ate as kids, but with an adult twist: a liberal spilling of port. The dark brightness, the sticky consistency, the little flecks of fig seeds — they all make these a joy to eat. 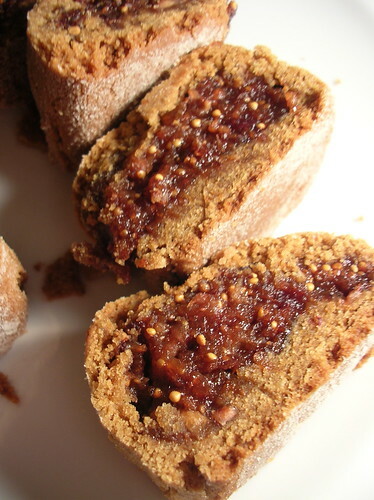 Bite down and taste the molasses and nutmeg cookie crumble in the mouth, then dart around your tongue to lick the fig off your teeth. Theyre milk-dunkable and sophisticated at the same time. And I dare you to eat just one. The flour combination is vital here. Rice flour and cornstarch together make a smooth consistency. Teff flours softness makes it all hold together beautifully, to give that slighty sponginess that the brand-name fig newtons have. And the millet flour makes for a crumbly consistency. It took me too long to break down and buy xantham gum, because its so darned expensive. But its worth it, because a full recipe like this only calls for half a teaspoon. Be sure to store it in the refrigerator, though. All gluten-free flours do better when refrigerated. Enjoy them. I hope these help you feel like a kid again. Chop the figs into quarters. Put them into a large bowl and cover with the liquids. Soak the figs in these liquids (or play with your own combination) for at least twenty-four hours in advance. 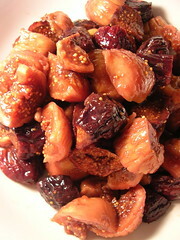 Before you make the cookies, drain the figs of the liquid, except for a few tablespoons. Put the figs and remaining liquid in your food processor and blend until it is a thick paste, somewhat like a tapenade consistency. Mix all the dry ingredients together in a medium-sized bowl. Set aside. Melt the butter on the stove, or in the microwave, if you must. Pour the melted butter into your favorite mixer (if you dont have a stand mixer yet, you really should splurge. They make all the difference in the world). Add the brown and organic cane sugar to the butter and mix them together. Mix them only until they are blended, then turn off the mixer. Add the egg, the vanilla, and the two tablespoons of molasses. Mix until just blended. Add the dry ingredients, and mix until the dough is thoroughly blended. Refrigerate the dough in the refrigerator for at least an hour. This is key with gluten-free doughs. After you have chilled the dough, roll out one-third of it to a half-inch thickness. (Be sure to flour the board first. White rice flour seems to work best.) Spoon some of the rich fig spread down the center of this circle, then roll the dough up into a little log. Do the same with the remaining dough and spread. Place the three logs of fig goodness onto your favorite baking sheet, covered with parchment paper or a silpat. Slide it into the oven for twelve minutes (less or more, depending on your oven), checking once in a while to make sure they arent browning too much. Take the logs out of the oven when they are firm to the touch and just starting to brown. Let them cool on a wire rack for ten minutes. When the cookies have cooled just a bit, slice up the logs in inch-thick slices, or as large as you want. Turn them onto a plate, and they look like fig newtons. But you never ate anything this good as a kid. So much better than the ones that came in plastic. Makes twenty to thirty cookies. Could you do a post about what you’ve found about the textures of various flours? Or some links to places where someone has experimented with how various flours behave? This info seems to be difficult to find, at least in books — they all say “yeah, well, if you can’t use wheat flour, well, there are non-gluten flours available”. I’ve been making my own bread for years, and prefer a “whole-grainy” taste, rather than trying to duplicate the typical western love of gluey white flour. So at the moment I’ve settled on buckwheat, with a little rice and potato flour thrown in for softness. I find that ground flax seed helps with moisture, and millet, as you say above, makes things crumbly — NOT what I want in bread! Teff truely IS wonderful in bread, but here in northern Germany it’s really expensive — my frugal nature won’t allow me to keep it in the quantities necessary for weekly bread making. I do look forward to trying your fig newton recipe, and teff would be great for an occasional dessert. But I’m still looking for info so that I can come up with appropriate recipes for home-made pasta (gluten-free pasta from the health-food store is suitable for covering with a strong-flavored sauce, but let’s face it — it ain’t italian wheat pasta!) and other things when the inspiration strikes. Also, here in frozen tundra Germany, xanthan gum is hard to find, and my hubby and I find it gives an unpleasant gluey-ness to things. We use guar gum or St. John’s Bread (carob?) flour as thickeners instead. We get them from the healthfood store. Thank you for sharing your inspirations with us! Fantastic, Shauna. I have been working on a newton recipe myself for quite some time. Nice job! Glad you fig-ured out a recipe for those cookies. I love those dark Mission figs as much as you do. Will ask for a care package on your next visit. Congratulations on finding your way back home to improvisational baking! Your fig newtons look absolutely delicious, (just like every other food you give us a glimpse of here. I suppose I should be accustomed to being ‘wowed’ when I stop by here for a visit; somehow it feels new every time). Some months ago I saw some manufactured gluten free fig newtons on a shelf somewhere. I didn’t pick them up and haven’t been able to locate them since. Thank you for posting this. I will definitely be giving them a try! The Figs? They look fabulous! But I can eat wheat. And I don’t have any of the flours you used on hand. Can I use my unbleached, all-natural white flour? And I can’t have alcohol. Can I skip the port? I just want to say that I’ve been reading your blog for a few weeks now and I am so impressed with your cooking, your recipes and your overall cheery attitude. I don’t blog but wish I had it in me to do that. My cooking is pitiful, at best. Forgive me for jumping in but I just had to say you truly are an inspiration. I don’t have health issues but so admire your willing spirit and efforts to continue keeping yourself healthy. Good job and I did see your nomination and made sure I voted!! Thanks for the joy of reading your blog and hope you don’t mind that I found my way here. What gorgeous newtons! I’ve never been a huge fan of figs (they’re a bit too sweet for my taste on their own), but the fig spread in these sounds good enough to eat with a spoon. I found my way here from your comment at Bakerina’s re: dinner in Seattle. I’ve wandered around your blog a bit – thoroughly enjoying your writing while doing so – and have realized that we must be neighbors, or close to it. I live east of Queen Anne Ave, about a block from the 5-Spot, and frequent most of the Queen Anne places about which you’ve written. Funny that I had to go all the way to NYC to find your blog. Molly, my dear, if you had been here, I would have let you swipe a fingerful. They were rather delicious, I have to say. I took them to school today and all my colleagues gobbled them up. Judy, I will certainly try to do a post about what I’ve learned about the various flours. I have so many planned…. I find teff best for soft baked goods, like these cookies, or the banana bread I made a few weeks ago. Millet makes good scones, because of the crumble. Have you tried quinoa flour in your breads? It has an interesting nutty taste and texture. It might do. Keep me posted. Nic, thank you, my dear. I have to say, I was really quite proud of this one. I’m sure your newton recipe will be spectacular! David L, oh my, the pun. Bravo! I’ll certainly be happy to bring you some when I next come to Paris. It might be awhile. Sigh. Beastmomma, thank you, my dear. But you know? They’re really pretty easy to make. I know you could do it. Blurgirl, thank you, so much, for your words. I’m always happy to see you here. And I’ll try to keep wowing you! Tammy, my dear, how could I possibly mind that comment? My goodness, you made my day. I’m so happy to know that I’ve inspired you. And I’m sure you could do this too! Thank you, again, for your kind words. Kimberly, well I love that Ms. Bakerina brought us together. If you’re near Queen Anne, we should meet for coffee sometime! I’d love to meet another neighbor. Oops, somehow I left out two comments! Sasha, you must try these. I’m certain that they’re far better than any package could be. Anonymous, you made my day. Someone wondering for how to substitute for the flours I have to use? Ha! Of course you could use flour. I might suggest a little whole wheat flour, or some softer semolina. You want something crumbly. Also, of course you can skip the port. Use orange juice instead, or any flavor combination you like. I hope they turn out well for you! Shauna, these look like they would taste great! I was thinking of you last week when our local paper did a whole article on celiac disease and being gluten-free. They talked about a couple who started their own catering/food company because it was hard to find food to eat for the wife. Their site is http://www.grandmaferdons.com/. They also mentioned this magazine, don’t know if you have seen: http://www.glutenfreeliving.com/. I have only been gluten free for four months, and while I have been feeling better than I ever imagined possible, I have really struggled with the emotional aspects of giving up some of my favorite foods. Your blog has been such an inspiration to me- you are so positive and I find much encouragement in that. It makes me challenge myself to see this diagnosis as the blessing it is, instead of as a curse. I have purchased all of the gluten free flours, but they have been sitting unopened in the pantry. Homemade noodles, cookies, and pies used to be my forte. The thought of finding new recipes and learning to use these exotic flours has just seemed unbearable. But I see all of the wonderful foods you create and it gives me hope that one day I can haul back out the mixer and the bread machine, and create something delicious that won’t make me sick. I am saving all of your recipes for when that day comes. Recently diagnosed here. Actually that is not entirely true. Recently rediagnosed here. It is nice to see recipes and hear a positive voice about living without gluten because right now, I am feeling pretty bitter about it. I like the idea of there being more molasses bite in there. They sound very good (and the dash of alcohol sounds like it helps too). One other thing: I enjoy the idea of getting together to share something hot, perusing the local fine foods shop on top of Queen Anne… however my computer has difficulty initiating an email to your account via Blogger. Would you like to try mine? Yay for gf fig newtons and for the Hoosier Hot Shots… Was it “we like bananas, because they have no bones.”? your pictured newtons remind me of a soymilk ice cream series they just released over here (japan). One of the flavors is rum fig, and my favorite part about it (besides the taste of the figs) is the crunch of the little fig seeds. it’s so satisfying. I bet it’s just as tasty in these guys. I would make these in a second, but I can’t imagine where I would find these various flours, but I can imagine how expensive they would be…Figs though are really popular here, so maybe if I just used regular flour……. 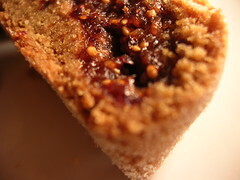 Haven’t tried your fig newtons yet, just found your site now. But I did notice tonight at Safeway that Paul Newman makes a gluten-free fig newton. I think I’ll try it since I’ve been craving one for a long time. Fig Newtons! I have craved them too and will try this recipe… Is there anything you would replace the port with that is non-alchoholic?? PS – I’ve tagged you on my blog. Melissa, please don’t pick the figs! Make someone else do it for you. And then you can make these cookies for that person in exchange. Dawn, thanks for the tips. I love these stories of families creating something out of this need. We can all do this together! And I do know Gluten-Free Living. It’s quite a nice magazine. Elizabeth, thank you so much for this wonderful comment. I’ve been carrying it around with me in my mind for days. You can do this. It takes time. But in the end, I think you might find that going gluten-free will make your life better than it ever has been before. Nixie Knox, hang in there. There are all kinds of psychological permutations of this, more than being a vegetarian. It feels, at first, like this has been taken away from us. But keep going. I promise — eventually you’ll feel better than ever before. It grows easier and easier then. Cybele, the molasses does make these cookies even better. I did look at the link for Figamajigs, which look interesting, but they do say: may contain wheat. For those of us who have to avoid gluten, we have to avoid products that say that. But at least they were honest! Elizabeth R, bingo! You have it. You know the Hoosier Hot Shots? That makes me truly happy. My brother used to play them for my nephew, when he was just a baby. Ah, they’re hilarious! And you must be cool. Travis, I love the crunch of fig seeds. And I’m sure rum would be fabulous in this recipe. As far as the flour goes, I enjoy the idea of anyone trying to substitute regular flour for these! There’s a turnaround. Use rice flour and wheat flour together, and you might be able to match this consistency. Kitchenmage, oh my dear, you’re never just a lurker. I love having you here. And I’m sure you would do a spectacular job with these cookies too. Valerie, they are pretty easy to make, if you have the flours on hand. Watch out for those Paul Newman’s — they might just be wheat-free, meaning they use barley flour. I noticed those too, then read the ingredients. Ssrafina, you must try these. Without the port, you could try some really great grape juice. Or, to be honest, the pomegranate juice might just be enough, if you’re trying to avoid the alcohol. Thanks for stopping by! your photos are yummy!!!! i think that you mentioned that you are using a digital nikon-which one do you have? Hello- Shauna- greatly enjoy your website and am currently soaking my figs to make my delicious fig bars- just started my own blog Of figs and men a week ago. I don’t suffer from celiac disease, but I have other allergies and am quite conscious about what I eat so I find your website hilarious, touching and informative. I also love that you live in Seattle, since I am going to move there from Salt Lake City, ut this fall! you are truly an artist. i think i will try these Fig Shaunas! they look just amazing – great photos, too. this is my first time visiting your blog and i am really impressed. i’ll be back for sure. Hi Shauna–I love your blog! I’m 23 and have been GF for about 6 or 7 years. It’s been so hard (as you already know) to check the labels of EVERYTHING. College living was the worst! Now I’m a grad student and living alone for the first time. I’m trying to be more proactive about making my own GF goodness instead of scouring the very small “specialty section” at the grocery. Lately, I’m in love with a brown sugar and fig lotion because it smells so yummy. It inspired me to google for some fig inspired recipes. I found your website yesterday, and today I have figs, port, and such soaking. I can’t wait to break in my most exciting Christmas gift (my first Kitchen-Aid!) with this fig goodie. I didn’t find teff or millet flour at the store, any tips on what type of grocery might carry them? If I can’t find them, any suggestions for other flours? What about Bob’s Red Mill baking mix or quinoa flour? Also, have you ever seen either teff or millet flour (or xanthum gum) in the bulk section? Finally, any ideas for a great GF gingerbread? I used to love these cookies when they were soft and crumbly, with an awesome ginger kick. Now, any store bought cookie I find is dense and not nearly as flavorful as I remember. I’d love any tips (or a recipe). Thanks again for the awesome website and all the stories! I cannot wait to try out the pizza dough ASAP! Shauna these are beautiful (as is the rest of your site) and I want to try them. I am confused though, as I always thought Teff was another name for millet or at least in the Millet family. You are using Teff and Millet one for softness one for crumble so I am stumped. I do have millet and have no access to Teff. Is there another GF flour I can use in place of the Teff (quinoa, soy, sorghum etc) for the softness? I do not really know which GF flours have what consistency, so I do not even wish to attempt to sub another flour for the Teff, until I ask you. I do not wish to waste all the ingredients if my sub does not work. Thank you for your beautiful recipes, your dialogue, the inspirational photos that let’s me know GF ravioli and other GF recipes are not only possible but beautiful and yummy! peace! as i am a total fig newton nut with a celiac boyfriend i had to try these out. it was my first GF baking expedition and a great way to start gathering the multitude of GF flours, which i’ve been meaning to do. they are delicious! so much more divine and sophisticated in flavor than any packaged newton. and to boot, they were super easy to wrap up and ship to my boyfriend with little fear of them turning into a box of crumbs. this recipe will certainly become a baking staple. This recipie is absolutely wonderful-my first gluten free baking experience. I read about this recipie in your book and then after returning it to the library decided I couldn’t stop thinking about them and needed to make them! I was thrilled to find the recipie on-line, but it seems different from my memory of the one in the book-is there a difference in the dough? This one tasted incredible tonight, but rolling it into a log didn’t bake up well for me and I have these fig bar chunks rather than cookies-taste great, but low on presentation! any advice? I was reading a post in which you suggest substituting orange juice for port. What lead you to use the port to begin with? What other flavors do you recommend? With gluten-free recipes especially, I hate to substitute ingredients but at the same time, the port seems like a steep investment (at least, on a graduate student stipend, ha ha). Yum! I made these yesterday for the Christmas party/dessert competition in my classics department, and they won second place! (The homemade chocolate truffles won first… I guess you can't beat chocolate.) I'm dairy- and egg- free too, so I used earth balance and flax egg. The dough was really really dry and crumbly; I had to add water to roll them out, and they took way longer than 12 minutes to bake, but they still turned out great. Most of the people at the party didn't even know they were gf and vegan. Oh and I also soaked the figs in tangerine juice and rum because that's what I had on hand. Thank you! I love my mini-processor for such tasks, but mmm, a Kitchenaide would be sooo nice! Thank you so much for this lovely recipe. I made them today so my kids wouldn’t be left out tonight at vacation bible school where Fig Newtons are being served for snack. Of course I took lots of liberties and substitutions to make these dairy and egg free, plus to avoid a run to Whole Foods, but they still turned out great. Thanks for the awesome recipe! I have made your fig newtons, following your recipe exactly, multiple times, and every time they bake differently. Mostly they seem to spread too much and crack on the top. Everyone always loves them, regardless of the form/shape they take, but I’m frustrated. Should they be folded or rolled? Maybe I am not rolling them tightly enough. (We don’t want pinwheels, right? Because the filling is just in the center, when they’re rolled does that cancel getting the spiral effect?) Only once when I made them, did they come out looking like yours in the photo, and I don’t remember what I did. I have tried putting them in the fridge for a few minutes to harden them up before baking but that didn’t top the spreading either. It got to the point that I actually measured the thicken of the dough to 1/2″ one time, instead of eyeballing it…those spread and the underlayer never cooked enough. They were a mess! Would love any suggestions you can offer. I’m a pretty good baker, so the fact that I cannot “master” these drives me a bit crazy!! Thanks for any help you can give me. Liz, this is a great question. Tell you the truth, I created this recipe the first year I kept this blog, when I knew so little about gluten-free baking that I sort of blush. I’ve been thinking about going back to this recipe and giving it the meticulous care and writing I give them now. Give me a couple of months. I will.